Huge Savings Item! 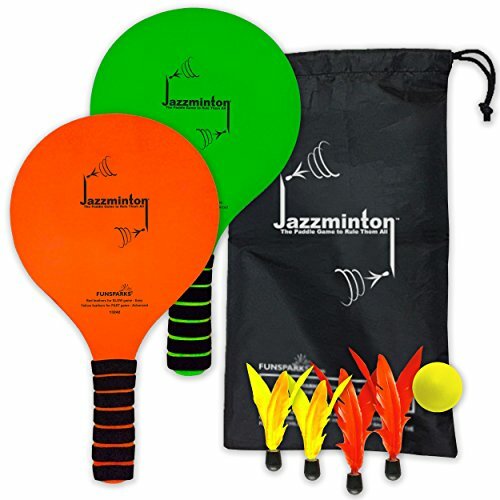 Save 20% on the Funsparks Jazzminton Paddle Ball Game With Carry Bag - Indoor Outdoor Toy - Play at the Beach, Lawn or Backyard - 2 Wooden Racquets - 4 Shuttlecocks - 1 Ball by Funsparks at Ipswich Recreation. MPN: 43234-1678. Hurry! Limited time offer. Offer valid only while supplies last. Funsparks Jazzminton Paddle Ball Game With Carry Bag is on the go fun. You can play a slow game with the feathers or a faster game with the ball. Funsparks Jazzminton Paddle Ball Game With Carry Bag is on the go fun. You can play a slow game with the feathers or a faster game with the ball. It's so much fun! The magic of this game is that due to the spin of the birdies the game adjusts itself to the skill level and the mood of the players. This paddle game is similar to Speedminton and Badminton but easier to play for kids because of the shorter handles. So if you want to play slow and easy you have great fun or if you want to play hard and fast you will have a blast. We guarantee you have a great time and tons of fun, why... you can return it within 30 days for a full refund no-questions-asked. It's great for your hand-eye coordination and cardio. You can play as near as 5 feet to 30 feet. You can play sitting on a sofa or wherever you like. Play solo by hitting it straight up. The most fun toy for boys and girls. Great gift for birthdays, invitations for grill parties, pool parties or simply a gift for someone who likes to play and be active. Includes: 2 fluorescent paddles, high grade plywood 1 ball and 4 birdies; 2 for slow play and 2 for fast. Feathers are glued to the birdie tip with special water-resistant glue so you can play in and around any body of water. 0 days no-questions-asked free returns. If you have further questions about the product please ask us through our Amazon Funsparks storefront "Ask A Question" and we'll be happy to answer.